I was first introduced to blogging somewhere in 2007 when business blogging was a new phenomenon in the West and my office was trying to understand the in’s and out’s of it. I even started a blog back then. It was more on the grounds to familiarize myself with the blogging world and the etiquettes around it. Later my first blog was put on back burner because of other pressing ideas that needed attention. It was also a time when my daughter arrived and I was way too busy figuring out the ropes of being a mom and handling the responsibility in a nuclear setup. Husband was too busy and is by nature a reserved personality while me being the opposite. All in all, I was kind of drowning and I didn’t know what to do. When I feel like this, I take to learning new things! Weird, but that’s how my brain works. I started doing a few courses and certifications and the whole idea of interacting with people online, was liberating. This was the perfect outlet for me and that’s when I started my next blog. Though my blog started as a place to express my deepest feelings, a place to vent and pour my thoughts, it soon morphed into something else! Focus on your passion and take a plunge in the blogging world! Still sitting on the fence wondering if you should take a plunge into the blogging world? Let me share a few reasons that should help you make the decision. Creating a blog is extremely simple and free. You can start with a free blog on WordPress/Blogger or Tumbler and later on move to self- hosting. Just visit one of these sites, choose a theme and a name and voila! Your blog is ready! Start writing and hit publish to have the first post on your blog. You need not have everything thought through and set before you start a blog. Having your long term and short term goals fixed is a wonderful way to begin, but you can also evolve as you start writing. So, don’t let the fear of planning stop you. Blogging is a vast ocean and it does not end with writing. There are many who might not be comfortable writing, but video blogging (vlogs), podcasts (voice logs) or even photo blogs (picture logs) are various ways of blogging. There are a lot of platforms that offer multi-lingual mediums hence don’t stop yourself just because you are not comfortable writing in English. Every person is unique and you can showcase it on your blog. There are thousands of niches out there and millions of people writing in the same niche, yet every blog is unique as every person’s voice is different. The perspective and the thought that they bring are different. Showcase your personality, your knowledge, your passion for your blog to gain visibility and traction. Blogs have known to bring in clients, as you can showcase your knowledge and work regularly. So if you are a photographer, a writer, a food critic or even a designer, you can use blog to build your tribe, connect with your prospective customers and focus on developing your business based on your blog promotion. Today, when online marketing is gaining traction, blogging can be a great place to start a side hustle. There are a lot of brands looking for their products to be reviewed on blogs and social media platforms. You can be one of them! The people who do such reviews are known as micro – influencers. Based on your blog’s and social media platforms popularity you are slotted as influencer, micro-influencer etc. Apart from this if you are a niche blogger then you can also earn by affiliate marketing, ads and product reviews. Don’t let the naysayers or your own doubts get to you! Focus on your passion and take a plunge in the blogging world! New to blogging? Looking for some support and learning? Join our support group Budding Bloggers and participate to gain maximum benefits. I second your thoughts. I discovered a new self after I started blogging. It is a therapy that even I would highly recommend. My story is similar to yours so I could relate to each line. I started mine when I was a new mom and I’m so glad I did. It changed everything for me and made me so much happier, confident and most importantly keeps me occupied. I have goals and I love that so many people read my blog now. I was nobody and now I’m somebody on this vast world wide web. I’m so glad you shared your story, it will boost confidence in many readers. Blogging is really change our life and give us a new identity which we definitely deserve. My story is same, with two kids . I can’t work outside home but need to do something which keep me busy and something for myself. I am still growing and need help from friends like you. I agree with your insights on why to blog. It will be really helpful ready reference for all newbie bloggers. Keep blogging! I seems a great journey for you Neha, many women would resonate the same. I love it because you can be the voice of masses here and you hold a power in your niche. Great work Neha. I can relate to all the points. In fact, I was quite sure that I wanted to start a career in writing after my kids were born and knew online was a better option for a new mom. Today, my blog is my identity. I started to blog because I was on dependent visa after coming to the US and writing was always one of my likings. Utilizing the time I had in my hand in doing something I like motivated me to write. I see myself growing as a writer each day, with every blog I write. 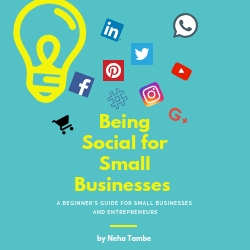 The blog journey of Neha Tambe exemplifies way to surge ahead with blogging as you benefit every way including commercial benefits. Lovely post. Saving for future reference when new bloggers ask. You are doing great with your blog, Neha! “As long as you don’t work towards bringing traffic to your blog, your site is one in a million in the obscure online world!”… this is so true and I need to work on this aspect with the pointers you have mentioned. Thanks for sharing! It was a pleasure reading your journey Neha and after meeting you personally and following you on AtoZ am so delighted to know you more. It was great reading about your journey Neha. I started writing 10 months back, after shifting overseas while trying to cope up with my father’s loss. Started writing my random musings initially and today I can see myself growing with the help and encouragement of fellow blogger friends. Loved reading about your journey Neha. Very inspiring and motivating. This is such an inspirational post for me and I could co-relate with each and every sentiment you had expressed. indeed, blogging is much more than just writing. your journey is really awesome and I would love to follow your footsteps. it is really great to get connected with you. 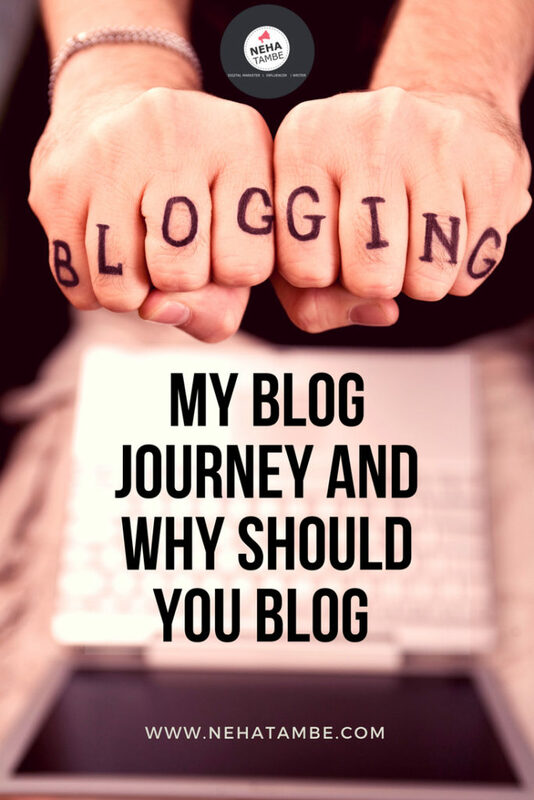 I am so glad that you shared to use your journey in blogging. You really did a great job on your blog. For me blogging is an extended version of me which i want to cherish forever and flipping through pages to treasure those moments. Isn’t it a great feeling, what started something as a time-killing activity to divert your mind is now ones’ passion and business identity! I relate with most points Neha! It’s always nice to hear someone’s story and it gives hope to newbie bloggers to pursue their blogging. This was quite inspiring neha.. loved all your points. These are also the reasons why I took to blogging. Blogging is a wonderful creative initiative. What I enjoy is your honest words about your journey. My blog is my identity and I can strongly say that. Totally relate to your article. Nicely put up. i like blogging because it’s a positive way to direct my resless energy and i feel good after sharing my thoughts. I started blogging too out of boredom when I was staying at home taking care of my little boy .It gives me happiness but I have been a bit lost about my goals and your post has helped me gather my thoughts a bit . Your journey is very interesting and inspiring. Thank you for sharing. Actually every Blogger has an unique journey n it’s worthy to know and learn from it. When I get free time I just check my blog, read my own posts…he he it makes me happy!! Now we have a friend with whom we can share anything at anytime. So aptly quoted Neha , never knew that you had such a vast experience in this blogging world. I must say blogging is your identity today and you are fulfilling your passion. I love my blog and everything that has come with it. It has given me a means of unleashing my creativity upon the world and I have an avenue of exploring certain sides of me that I otherwise wouldn’t have let out. For me, I love blogging because I have met some of my very best friends through it!This totally inspires me in working on my blog!! I love hearing what other people have to say about why they blog and what drives them. Very very very well written I will say. Every blog has a story and so does a blog writer. Yours is an interesting one. Blogging is such an interesting things these days, so many prospect and vision you can read through. Very well written articles. Your blogging journey has been filled with ups and downs. I am sure now you are loving your blogging journey.